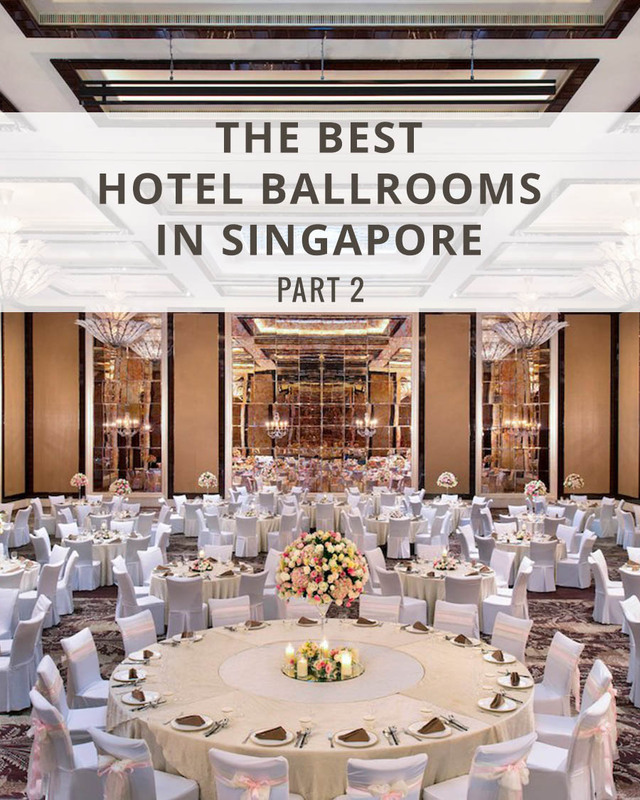 Loved reading our Best Hotel Ballrooms in Singapore article? Well, we’re back with part 2! 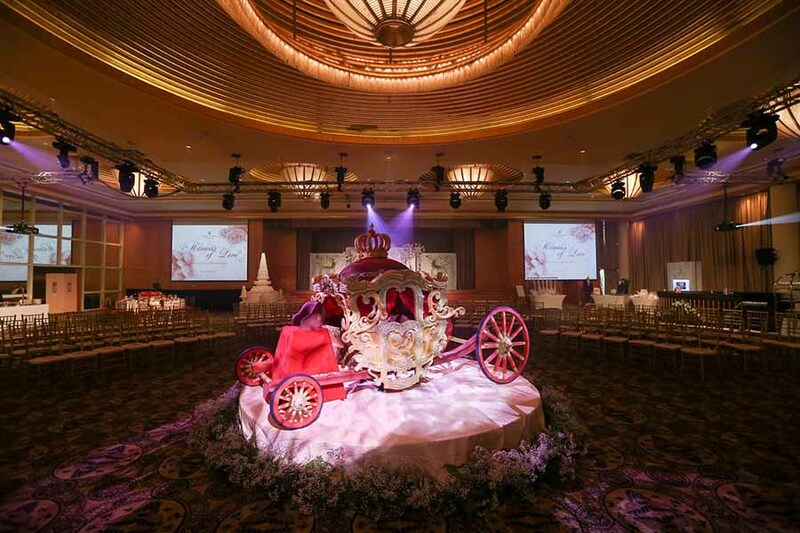 Check out 10 of the grandest and most luxurious ballrooms in Singapore for the wedding of your dreams, from stylish hotels in the heart of the city to hip and happening locales in Sentosa as recommended by these local wedding planners – The Wedding Stylist, Chere Weddings, Spellbound Weddings, Inside The Knot, Everitt Weddings, The Wedding Concepteur, Holy Moly, Smitten Occasions and The Wedding Atelier. 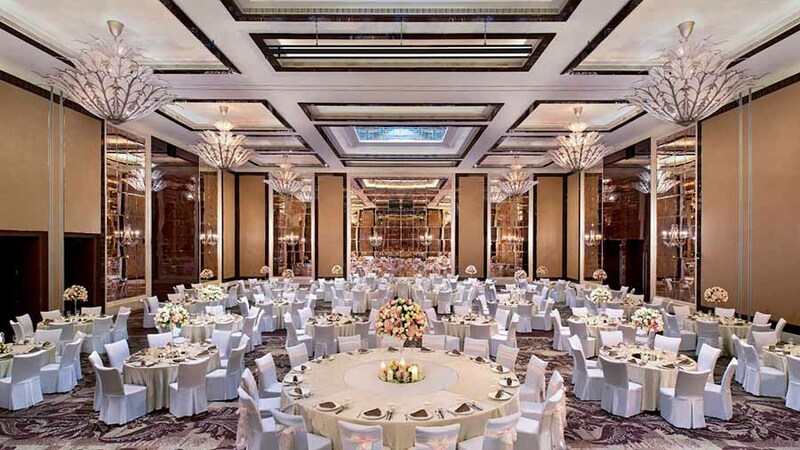 Spanning a total of 6,447 sq ft, Mandarin Oriental’s Oriental Ballroom comes in a curved, pillar-less layout that easily holds up to 420 banquet guests. 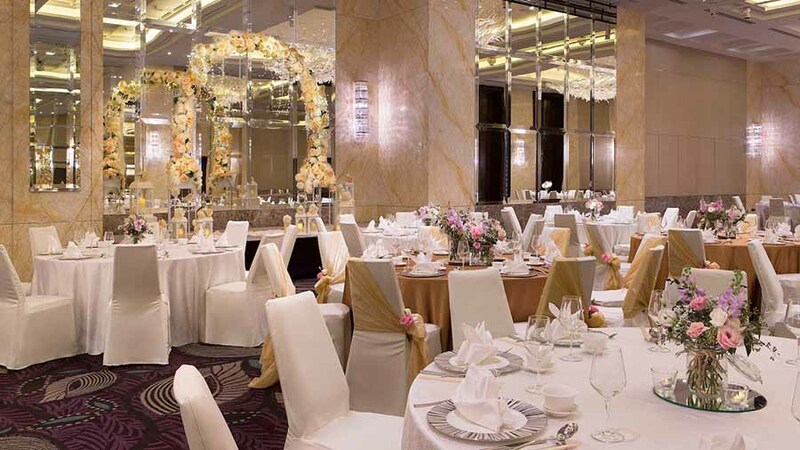 Wedding packages for Chinese cuisine range from SGD$1,508 per table for lunch to SGD$1,538 per table for dinner, with a minimum of 25 tables required. And if you’re hoping to do some good during your wedding celebrations, the hotel has teamed up with MINDSET, a local charity that aims to raise awareness about mental health issues in Singapore, to produce petite confectionery jars that couples can opt for as wedding favours in 2019. All proceeds from this initiative will go toward helping the individuals and families in need. 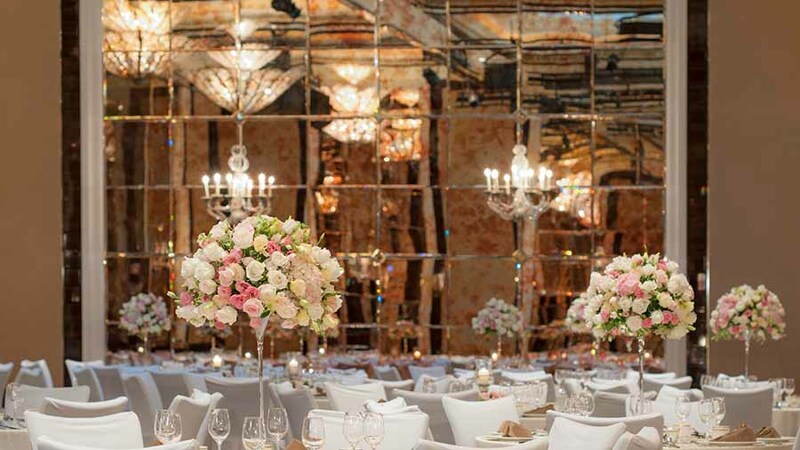 Thinking of throwing a lavish, one-of-a-kind wedding? 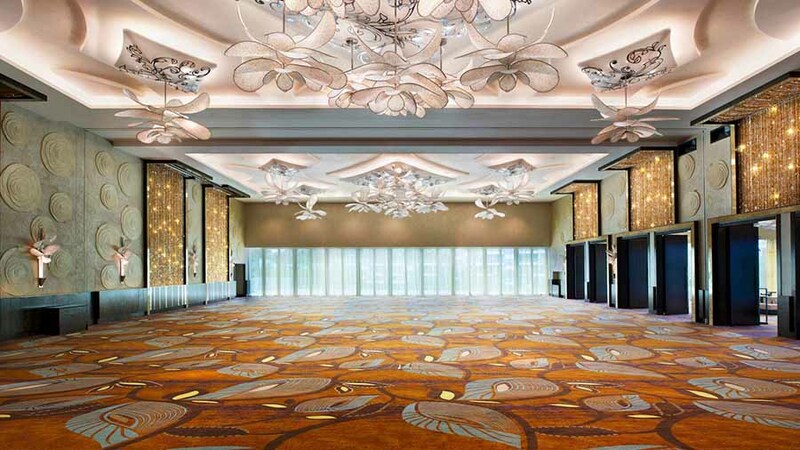 Then the Sands Grand Ballroom at Marina Bay Sands may be your best bet. 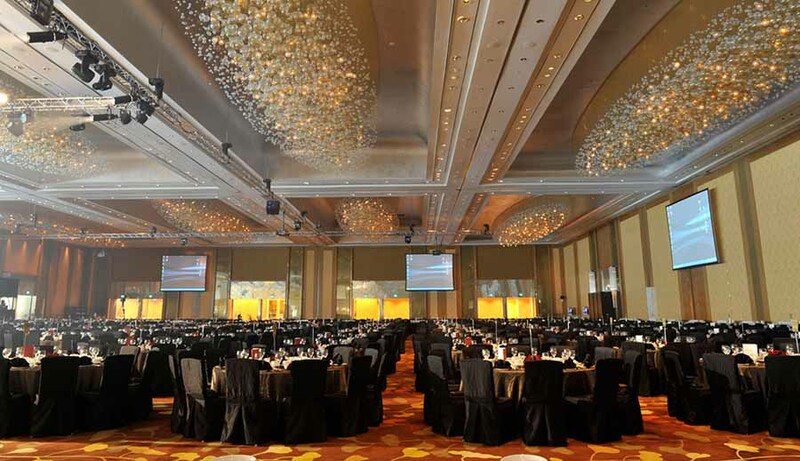 Billed as the largest ballroom in South-east Asia, it can seat up to 6,000 people for a banquet. With plush patterned carpeting, intricate lighting displays and high-tech visual equipment, your every whim and fancy will certainly be entertained here. The Happiness Lunch Package costs SGD$1,138++ per table of 10 persons, while the Double Happiness Dinner Package costs SGD$,388++ per table of 10 persons. Both packages include free-flow beer, one complimentary bottle of wine per table, and provision of other useful items like invitations and a red packet box. 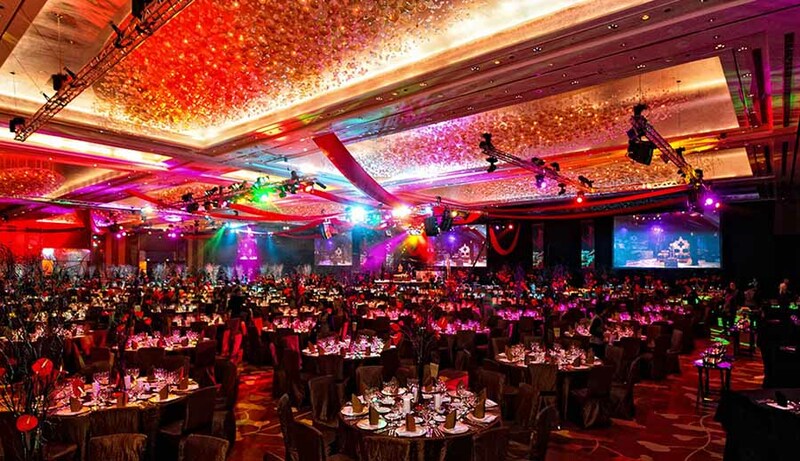 Recognised as one of the biggest ballrooms in Asia, Resorts World Sentosa’s Resorts World Ballroom features an 11-metre-high ceiling, elaborate décor and a capacity of up to 4,000 guests. Loved by wedding planners for its sheer size and easy loading and unloading of items, make this one of your top choices if you’re looking to hold a large wedding celebration. For a sumptuous eight-course Cantonese luncheon, prices start at SGD$1,188++ per table of 10 persons for lunch, and from SGD$1,288++ per table of 10 persons for dinner. Their wedding packages also include a complimentary one-night stay for the couple as well as the helpers, and unlimited beer during the banquet! Who says ballroom weddings have to be mainstream? 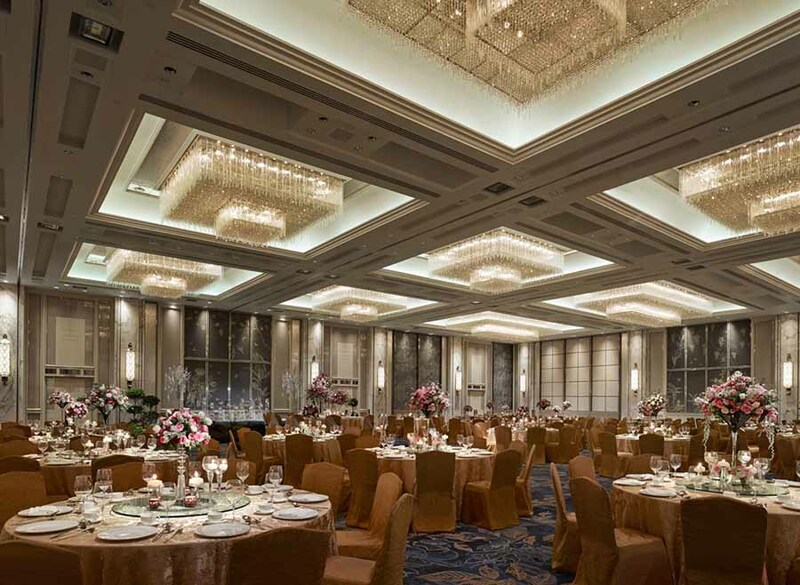 Get creative with your digital displays at The Ritz-Carlton’s Grand Ballroom, which is equipped with panoramic LED video walls, intelligent lighting and effects, and a top-notch sound system. Wedding planners also applaud this venue for its good location, plenty of car park space, and a foyer that offers a more private feel. It’s also able to accommodate up to 740 guests banquet-style. 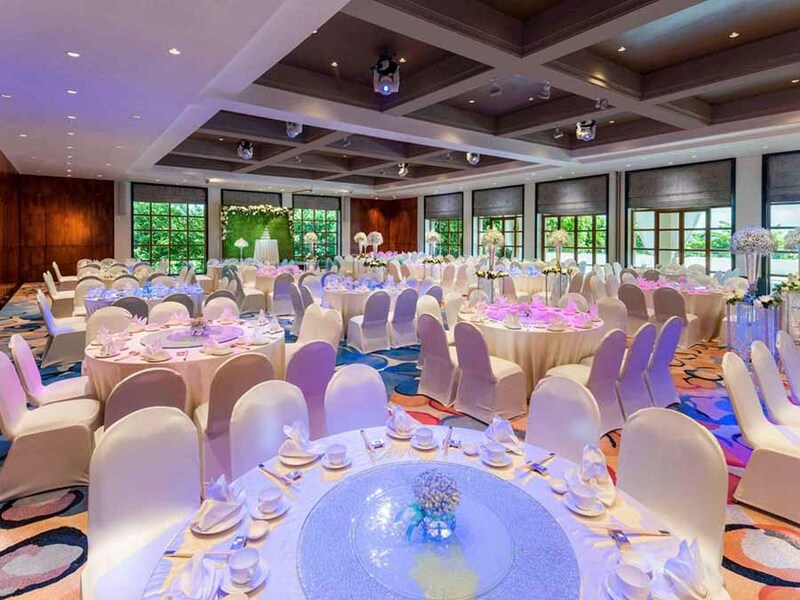 Wedding packages begin at SGD$1,588 per table of 10 guests for a seven-course Chinese set menu lunch, and from SGD$1,878 per table of 10 guests for an eight-course Chinese set menu dinner. These also include the provision of floral arrangements, one bottle of house wine per table, and a stay in the one-bedroom Millenia Suite. 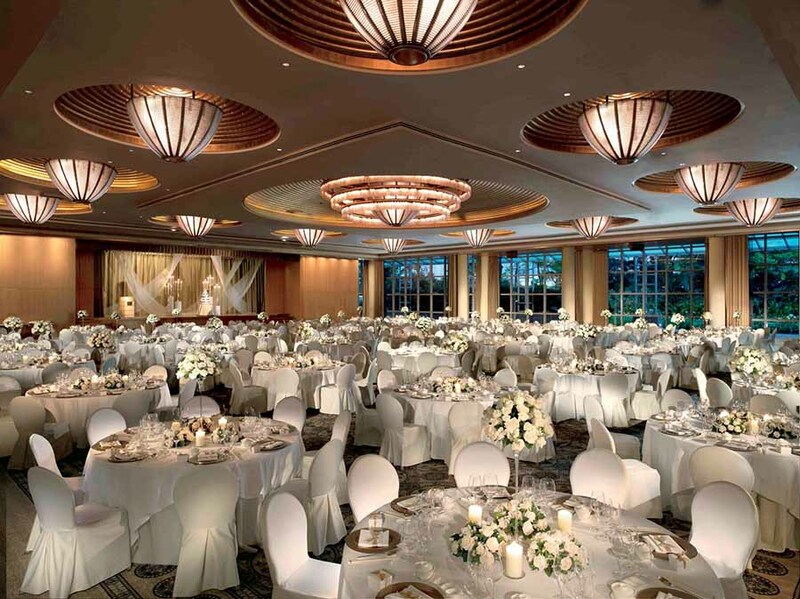 For an elegant and romantic wedding, look to the St. Regis’ majestic John Jacob Ballroom. Wedding planners adore its old-world colonial charm, the mirrored walls and the hand-cut crystal chandeliers lighting up the space, as well as the awesome service and trusted team. Whether it’s Cantonese or Western cuisine, your guests will be treated to some of the most mouth-watering dishes here (think foie gras, bird’s nest soup and oven-baked kurobuta pork). 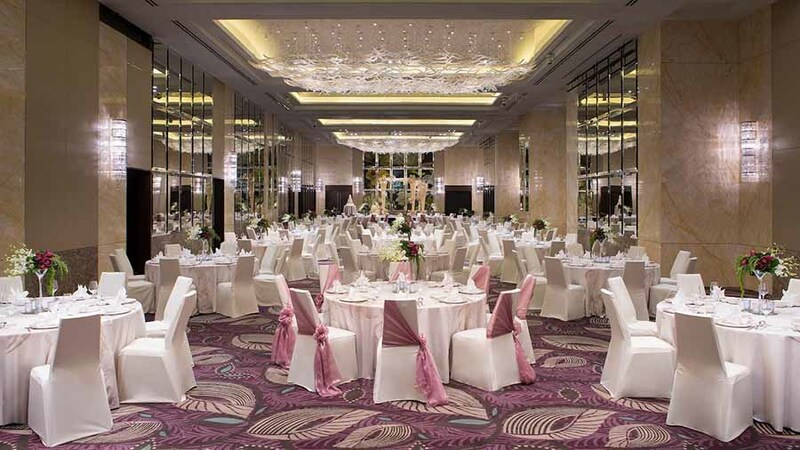 The Tower Ballroom in Shangri-La Hotel Singapore is the epitome of exquisite luxury. 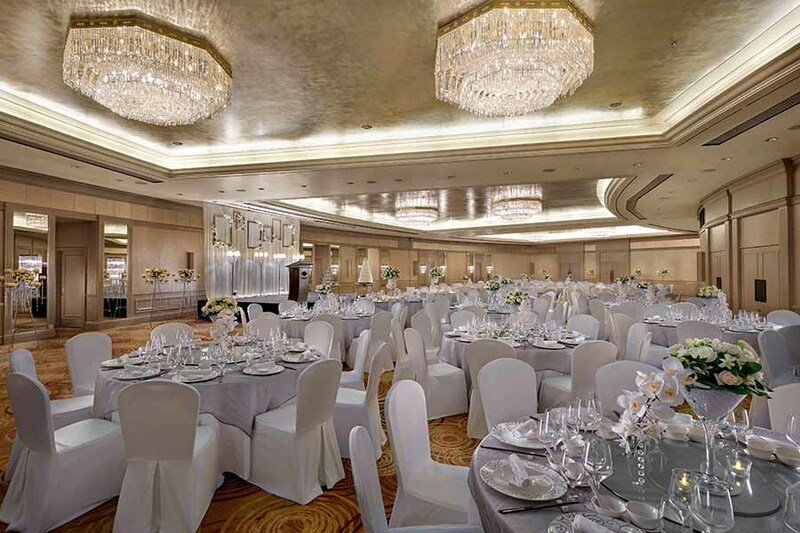 With a capacity of up to 590 guests for banquet-style seating, wedding planners recommend this ballroom for its gorgeous chandeliers, its size, and the fact that the stage can be moved anywhere. Plus, the hotel is centrally located and there’s ample parking space available. A wedding lunch here starts at SGD$1,588 and a wedding dinner at SGD$1,688, with a minimum of 250 and 350 guests required respectively. Couples who hold their nuptials here will also enjoy perks like choice of wedding favours, invitation card designs and fresh floral arrangements. 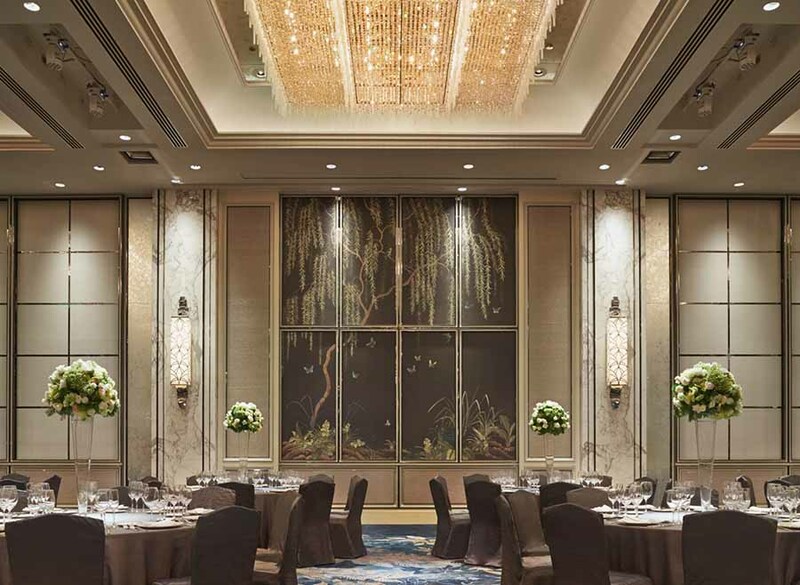 Nature lovers will dig Sofitel Singapore Sentosa Resort & Spa’s Straits Ballroom, which comes with glass-panelled French doors and refreshing views of lush greenery. Wedding planners love the modern, natural lighting here too (after all, it’s great for photos!). With a maximum capacity of 250 guests, a wedding dinner held on a Saturday will cost SGD$1,808++ per table of 10 persons for an eight-course Chinese set menu, or SGD$198++ per person for a four-course Western set menu. 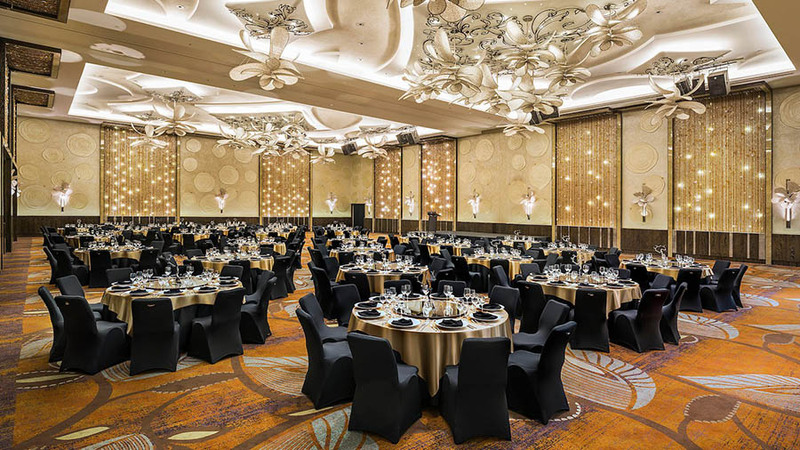 To pay homage to Nathaniel Wallich, the founder of UNESCO World Heritage-listed Singapore Botanical Gardens, the Wallich Ballroom in Sofitel Singapore City Centre is infused with floral motifs. Able to hold up to 350 guests for a sit-down banquet, there’s also an adjoining VIP room which is convenient for logistical purposes or for the changing of multiple bridal looks. What’s more, you’ll get a dedicated Wedding Butler attending to you to ensure that every aspect of your wedding is well executed. While The Westin’s Grand Ballroom comes in a conventional rectangular layout, their personalised dining experiences will certainly be a hit with foodies. Whether it’s an international buffet or a focus on Cantonese specialties, their chefs will be able to customise a wedding menu to suit your taste buds. The hotel has also prepared three wedding themes for couples to choose from, such as Blooming Elegance, which will fill the space with white and burgundy orchids, or Whimsical Enchantment, which is a combination of rustic and elegant influences. 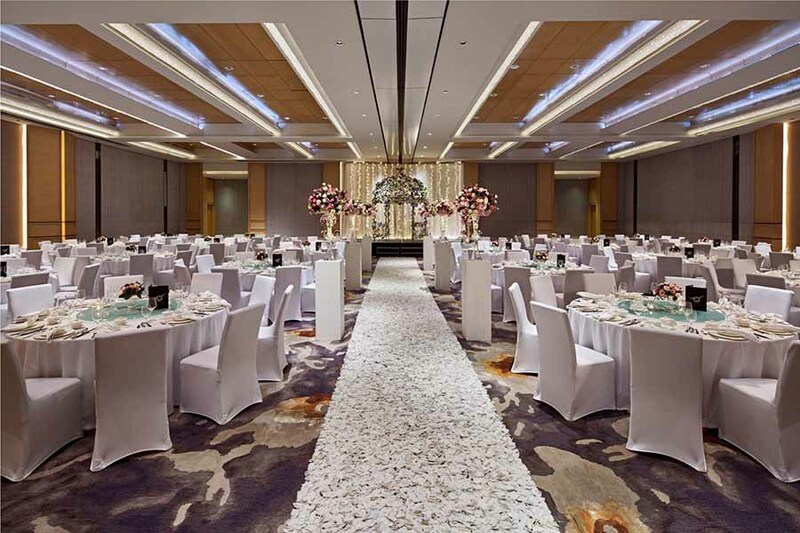 Wedding packages range from SGD$1,388 for a Chinese set lunch to SGD$1,688 for an eight-course Chinese set dinner, and up to $168.80 per person for a four-course Western style dinner or international buffet dinner. From pre-wedding to post-wedding, W Singapore’s wedding planners have got you covered. Indulge in a spa session before the big day, walk down the aisle in the Great Room (it holds up to 48 dinner tables) with spotlights illuminating your every step and glittering chandeliers above your heads. Then kick back and relax with a bubble bath drawn specially for you on your wedding night, and enjoy breakfast in bed the next day. 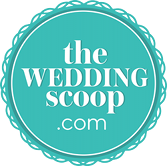 There you have it Wedding Scoopers, we hope this feature helps you find the perfect wedding venue for your weddings in Singapore! Want to share your own Singapore venue recommendations with us? Drop us a message on our Facebook or Instagram pages! 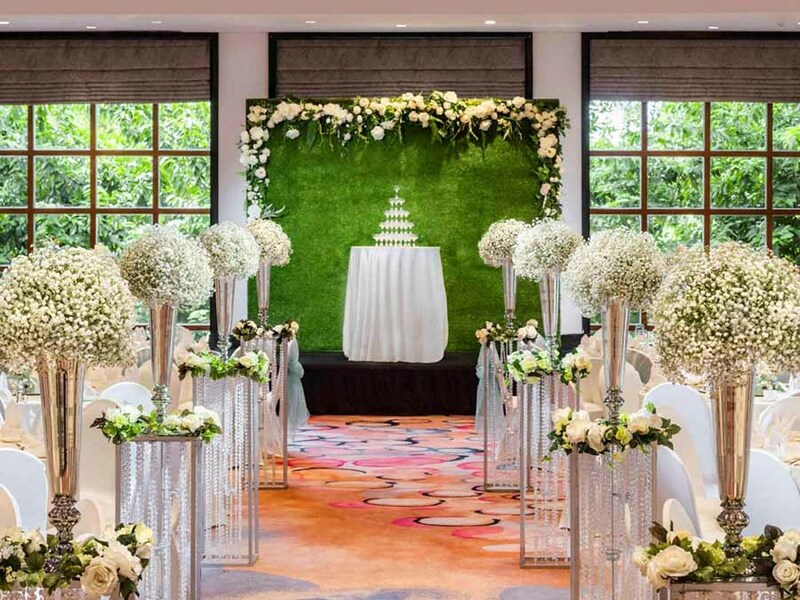 Thanks again to The Wedding Stylist, Chere Weddings, Spellbound Weddings, Inside The Knot, Everitt Weddings, The Wedding Concepteur, Holy Moly, Smitten Occasions and The Wedding Atelier, for sharing your favourite wedding venues in Singapore with us!